That’s the thing about kids. They need room to play and they come with lots of “stuff.” Even when DH and I take the minimalist approach to child-rearing and “stuff-having,” we have still ended up with more “stuff” than we’d like. I am that weekly purger who is constantly sending little bits off to the thrift store because I don’t like clutter about. Living in the PNW, I have a lot of scarves. They are a rain shield, a removable layer for warmth, a baby blanket, a water-bottle holder, a napkin, a spit-up cover, a nursing cover, a baby toy and (gasp! ), a fashion accessory. That is how I “justify” having a few scarves around. When I say around, I really mean it, because in the colder months of heavy use they end up everywhere. I figured out a super easy way to organize them, as well as my husband’s ties, (and perhaps my bras too), and it only took a second to make. 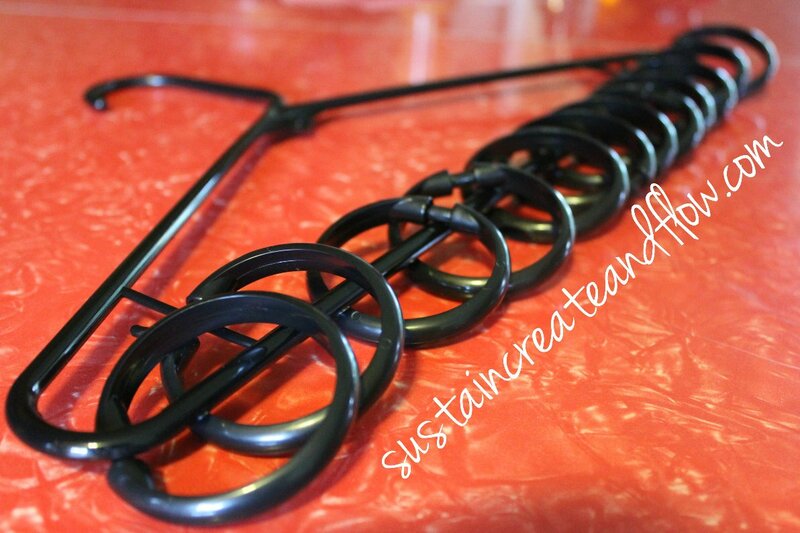 All you need is some shower curtain rings and a hanger! What types of things have you come up with to organize and de-clutter your house? 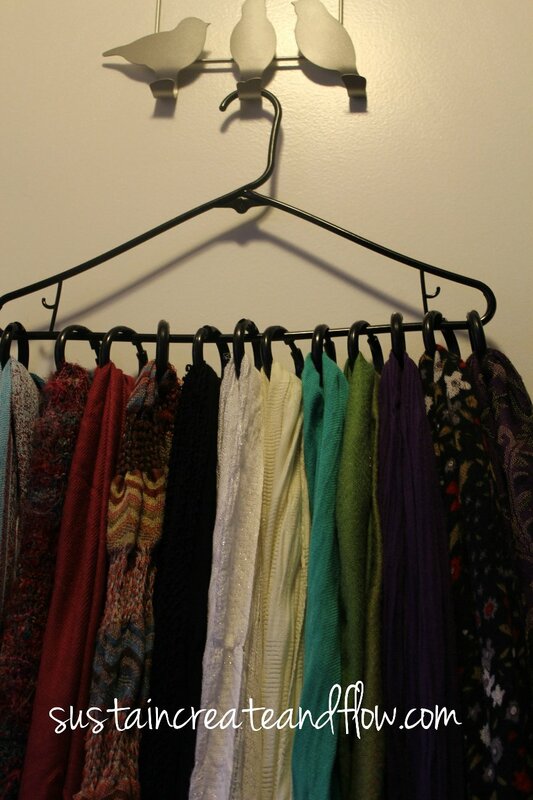 Can you think of anything else to hang on this rack? Hi I have done a similar hing with jeans using the curtain hooks with the clamps.. I hook the jeans through the back belt loop.. I will blog it soon at memosinstilettos.blogspot.ca.. I will Pinterest you, maybe you can do the same for me.. Thanks, Jo! I will totally pin you 🙂 That’s a great idea! Great Idea! I do something like this for belts. Screw in little hooks to a wooden hanger and hang your belts from the metal ring 🙂 The blog’s looking great Jerica! This past winter I got a little obsessed with scarves and ended up with a big collection! I was just sloppily hanging them on a hanger. 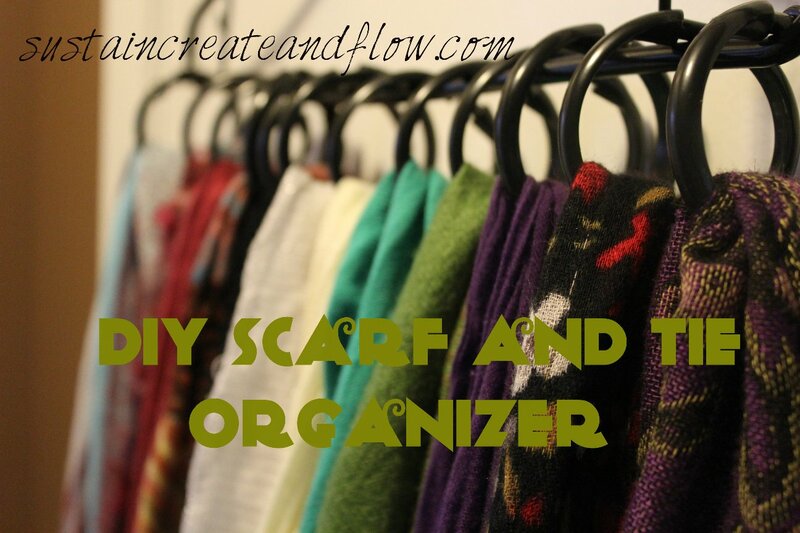 This method lets me access each one individually and keeps it all organized! Thanks for the great idea & linking up to Frugal Crafty Home! I love this idea America. I love this! I have them on a hanger now. 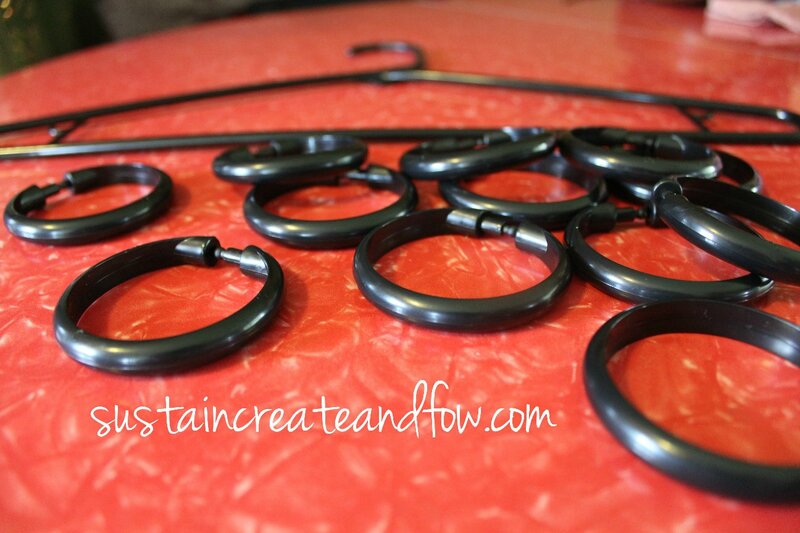 Will be getting shower curtain rings TOMORROW! 🙂 Oh, and I pinned this too!